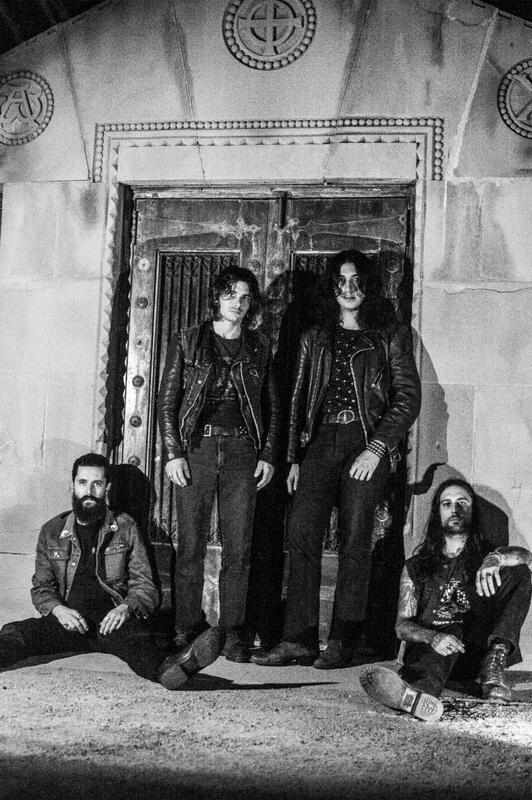 As the self-titled debut full-length from Los Angeles-based psychedelic metal unit DEATHCHANT draws ever closer to release, Cvlt Nation offers up "Control" for public delight. The band said, "'Control' is about the police state we're in and the assembly line-esque processing of new officers and existing officers being transferred all around to avoid termination or repercussions for illegal actions. The mental health degradation associated with paranoia, surrender, and fear as citizens and as those cops alike is an unnatural dehumanization... that's the lyrical content anyway." Hear "Control" at Cvlt Nation. Deathchant was captured live over a two-day period at a secluded cabin in Big Bear, California, and manifests an immersive wall of noise-induced heavy metal mania that is equal parts paranoia and transcendental harmony. The seven-track offering will be released on January 10, 2019 digitally and on vinyl via King Volume Records with Dune Altar handling the cassette edition. For preorders, visit the King Volume Badcamp page where "Pessimist" and "Hex" can be streamed. California residents can catch DEATHCHANT live next month with additional shows to be announced in the coming weeks. DEATHCHANT is the brainchild of TJ Lemieux (Child, Psychedelic Speed Freaks, Mainline Ladies, Babylon) with John Bolino, Colin Fahrner, and George Camacho. They've been dubbed psychedelic rock, proto-metal, doom, stoner metal, noise-punk, hard rock, and everything in between, but if you ask them, DEATHCHANT is just, "rock and roll with psychedelic influences." Fluctuating between peaceful, meditative, eastern-tinged messages of unity and all out warcrys with an underlying lesson of love and peace-through-violence, the band is driven by Lemieux's brooding aesthetic and signature psychedelic guitar atmospherics. DEATHCHANT echoes through the darker side of proto-metal and hard rock creating a sound that is loud, massive, and about as melodic as a sonic assault of this magnitude can be. They resonate with wherever or whoever you are and deliver an excitingly raw and catchy brand of unforgetting rock and roll. The band's debut was written by Lemieux, mixed by Lemieux and Stephen Schroeder and engineered and mastered by Schroeder.